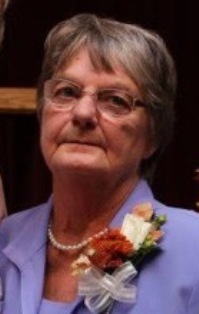 Emma L. (Cordner) Loeffelholz, 81, of Sparta, died Sunday, March 24, 2019, at Gundersen Health System, La Crosse. She was born July 13, 1937 to the late Thomas and Esther (Smith) Cordner in Sparta. Emma grew up in Farmers Valley. She married George Loeffelholz on February 18, 1958 in Black River Falls. George preceded her in death on May 5, 2012. Emma worked at Dairy Queen in Sparta for 13 years and at the Morrow Home for 27 years until her retirement in 2007. She enjoyed gardening, sewing, crocheting, playing games on her tablet and going to the casino. She loved spending time with her grandchildren and loved her bird Sadie. Emma is survived by her four children, Julie (Aron) Schnitzler; Sue (Kevin) Cox; Dan (Michelle) Loeffelholz; and Jenny (Mark) Johnson; her grandchildren, Jessica (Eric) Frydenlund and their children, Daulton, Dawson, Corbin and Ansel; Adam (Carrie) Schnitzler, and their son, Oliver; Casey (Sarah) Cox; Becky (Jason) Haugrud and their children, Deegan and Devin; Colin Cox; Scott Loeffelholz; Nicole Loeffelholz; Tyler Loeffelholz; Kendall Johnson and Zander Johnson. She is further survived by five siblings, Margaret Erickson, Betty Berckman, Robert Cordner, Helen Tomlin and Thomas Cordner Jr. In addition to her husband, George and parents, Thomas and Esther, she was preceded in death by a brother, Richard Cordner. A memorial service will be held at 11 a.m. on Thursday, March 28, at the Lanham-Schanhofer Funeral Home, Sparta, with Reverend Randy Williamson officiating. Burial will follow in Farmers Valley Cemetery, rural Sparta. Family and friends are invited to visit at the funeral home from 4-7 p.m. on Wednesday and on Thursday from 10 a.m. until the time of services. Online condolences may be offered to Emma’s family at www.schanhoferfh.com. The family would like to extend a special thank you to Amber Oshan, PA-C at Gundersen in Sparta for the attentive care provided to Emma. They would also like to thank the Sparta Area Ambulance Service.